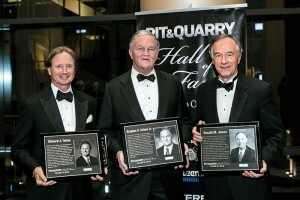 Aggregates industry leaders gathered March 20, 2016, for the fourth annual Pit & Quarry Hall of Fame Induction Ceremony & Dinner in Nashville, Tenn., where Rick Feltes (Feltes Sand & Gravel), Don James (Vulcan Materials) and Steve Zelnak (Martin Marietta) were enshrined as the 2016 class. More than 100 people were in attendance at the black-tie event. Feltes, James and Zelnak all attended the ceremony at the Omni Nashville Hotel and reflected on their storied careers upon being inducted. The new inductees will be represented in the National Mining Hall of Fame & Museum in Leadville, Colo., along with other Pit & Quarry Hall of Fame members. Feltes, who grew up in the aggregates industry, was a key figure in the development of the AGG1 Aggregates Academy & Expo, which launched in 2009 alongside World of Asphalt. Well regarded for his dedication to National Stone, Sand & Gravel Association (NSSGA) initiatives, Feltes has served the association in various capacities and as a chairman. Yet, his investment in NSSGA continued at a high level in the years following his chairmanship because of a drive to help others in the industry succeed. Feltes made sure AGG1 incorporated a mix of educational seminars, site visits and equipment exhibits to attract a wide audience of people from the aggregates industry. AGG1 has grown significantly since its inception, achieving records in 2015 for attendance, exhibitors, exhibit space and education tickets sold. “This industry has been very kind to me over the years, and I’m honored to be associated with it,” Feltes said. James, who joined Vulcan Materials in 1992, led one of the largest aggregate producers in the United States for 18 years, significantly expanding the company’s operations throughout the country. He guided Vulcan through periods of strong growth and difficult market downturns, positioning the company in recent years to increase operational efficiencies and maintain disciplined growth. Under James’ leadership, first as president and then as CEO, Vulcan’s enterprise value grew from $2 billion to about $10 billion; its permitted reserves base doubled from 7.5 billion tons to more than 15 billion tons; and the aggregates facilities it operates increased from 122 to more than 325. James served as Vulcan’s president from 1996 to 1997 and as CEO from 1997 to 2014. Zelnak, whose career in the aggregates industry began in 1974, grew Martin Marietta revenues from $450 million to more than $2.2 billion during his tenure as the company’s CEO. He joined Martin Marietta Corp. in 1981 as vice president of planning and business development for its aggregates company. And he was quickly promoted, taking on a role as president in 1982. Zelnak was elected an officer of the parent corporation in 1989, and he was promoted to president of the company’s Materials Group in 1991. In 1994, as president and CEO, Zelnak led a transition for Martin Marietta as a publicly traded corporation on the New York Stock Exchange. He was elected chairman of the company’s board of directors in 1997 and was responsible for more than 70 acquisitions, broadening the company’s geographic footprint. Zelnak also devised and implemented a unique long-haul distribution strategy, making Martin Marietta a leader in rail- and water-distributed aggregates products. In addition to Feltes, James and Zelnak, the induction ceremony brought two other members of the Pit & Quarry Hall of Fame to Nashville. In attendance were Paul Mellott, Mellott Co.; and Paul Detwiler III, New Enterprise Stone & Lime Co. Mark Deister, grandson of Hall of Famer Emil Deister, also attended the ceremony. The induction ceremony was supported by a number of sponsor companies. Gold Sponsors of the 2016 Pit & Quarry Hall of Fame are Haver & Boecker, Kleemann/Wirtgen Group, Terex Minerals Processing Systems and Weir Minerals. Silver sponsors are Am Cast, CDE Global and Philippi-Hagenbuch. NSSGA also played a supporting role in the Hall of Fame. The additions of Feltes, James and Zelnak take the total number of Hall of Fame inductees to 20. 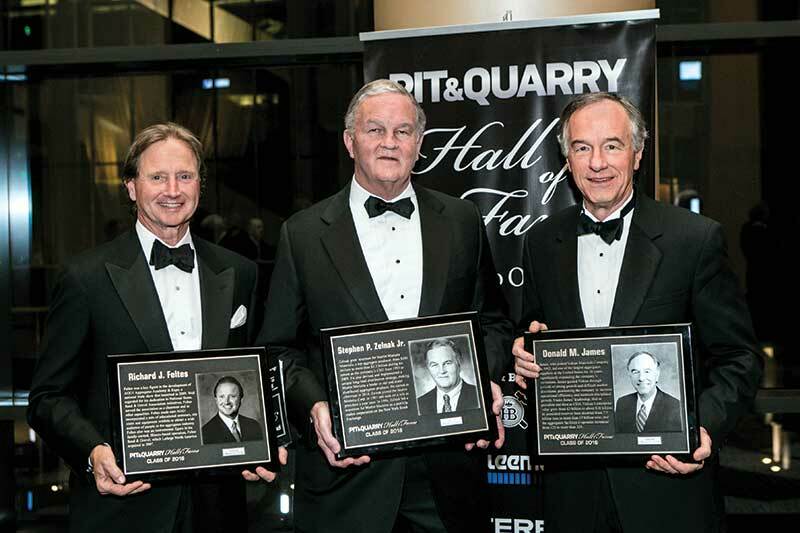 Pit & Quarry established its Hall of Fame in 2012 as a way to pay tribute to the pioneers of the past and the present-day industry leaders. Nominations are currently being accepted for future inductees here. Aggregate producers, manufacturers, suppliers, dealers, association and allied trade representatives are all eligible for induction to the Pit & Quarry Hall of Fame. A neutral board comprised of various industry segments reviews all nominations and determines which individuals earn induction.